If there is one thing Houston does not have a shortage of it is Mexican cuisine. From street taco trucks to taquerias it’s easy to make the assumption that you’ve tried it all when it comes to Mexican food when in reality you haven’t. Truth is I’s made that same mistake too - but this is one of those times where I’M SO HAPPY I WAS WRONG! I was recently invited by my friend Paul to try out a fairly new restaurant in Houston called Ambriza which translates to “I’m starving” in Spanish. I’ll be honest, I truly was starving when I arrived because I had no idea the location was over an hour drive from my home! Walking up to the restaurant I noticed a fun social vibe. The weather was nice and the outdoor patio was packed with people laughing and sipping on cocktails over light bites- I thought to myself, hmm this is a good sign. As I made my way to the front door I was greeted by my friend Paul who then pointed out the owner -who was busy walking from table to table laughing with patrons. I jokingly told my friend, this BETTER be good, I feel like I just drove to a different state after being on the rode over an hour!” Ayana it’s worth the drive! Walking in you will be greeted by traditional Dia De Los Muertos Dolls at the hostess counter, and you’ll see the whole restaurant pays homage to the traditional Mexican Holiday in a fun modern way. We grabbed a table the food and conversation started flowing. The owner, Julio Garcia, came over to greet us and I really didn’t expect him to stay too long because the restaurant was packed from wall to wall- but I was so glad that he did because I was able to learn so much about why this restaurant was successful. As we were served drinks Julio told us about how he worked his was up from washing dishes to owning multiple successful restaurants in Houston- which is definitely something to brag and puff your chest out about, but Julio was very humble in talking about his accomplishments, always crediting God for his success, not in an overly religious way but in a way that said, I can’t take all the credit. 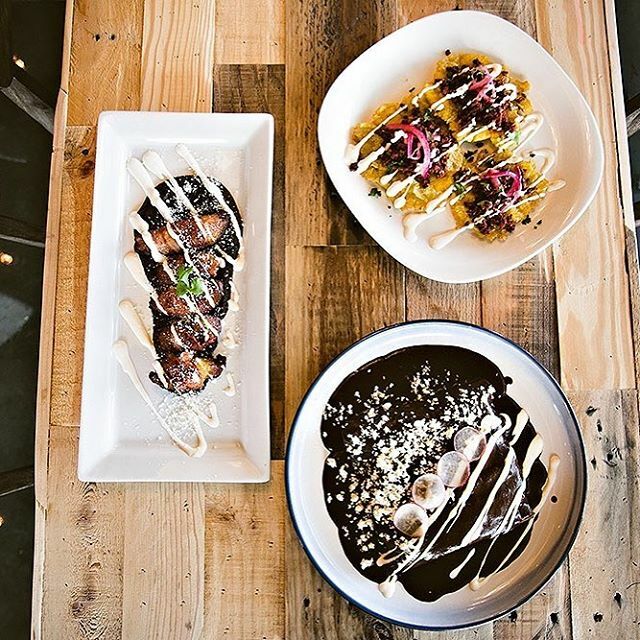 After serving a round or Margaritas voted the Readers Choice for the The Houston Press Houston Press in 2018, it was time to see just how authentically close to Mexico the food was going to take us. We first enjoyed the Guacamole production, that right….PRODUCTION! We were approached by two young ladies - one in full Dia De Los Muertos make-up, and the other ready to smash up a tray full of delicious avocados with what ever custom toppings you want to add like pineapple, cilantro, jalapenos in the biggest molcajete I’ve ever seen in my life! That was really cool to see, especially the girl with the makeup. She said it takes her up to 2 hours to get all made up for work, but she loves it because the customers get a kick out of it. This molcajete is bigger than my head….and I have a pretty big head buddy! I think I got a little too excited about the guacamole because I made the biggest rookie mistake ever……I GOT FULL OFF THE FREAKING CHIPS! That’s a definite NO NO NO! Never get full off the bread sticks and the free chips, everybody knows that! But it was too late, I was already licking the guacamole out of the molcajete when the waitress was coming around to offer us another appetizer. Next up, Elote, Or as I like to say in a cheesy Spanish accent……EL Corn! I love the attention to detail that is given to each and every dish that is brought out. All the way from the flavors to the plating - you’re getting little bites of authentic Mexican cuisine which is not to be mistaken for Tex Mex food. Oh, and speaking of the plats, they’re all hand made and imported from Mexico- another fun fact is when ever one breaks, the owner admitted that he cries a little inside….so cuidado mi amigos! The corn on the cob was the bomb! Juicy, sweet corn topped with topped with garlic aioli, crumbled queso fresco, and chile lime salt. It was so good that I ordered some for my 2 year old daughter, and when I took it home she literally ate the whole corn on the cob and carried the cob on the stick around all day and sucked all day like it was a sucker! Pretty dang good! My absolute favorite appetizer were these three little balls of heaven that I had never seen before in a Mexican restaurant. 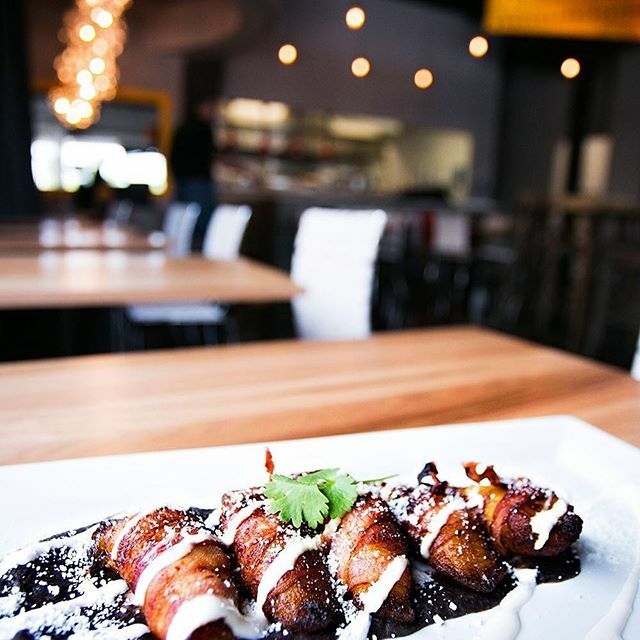 The Moletes - three plantains stuffed with chorizo and menonita cheese fried and serves hot were the perfect mixture of sweet and savory, the dish that made me break my vegetarian diet for the night, but it was soooooooooo worth it! I actually think I would make the hour drive from my side of town just to have the a margarita and the Moletes alone. All in all I would definitely recommend making a day trip out to Ambriza just to get a little taste of Mexico. After all a few bucks in gas is cheaper than the flight to Cancun you’d have to book for some of the best flavors offered south of the border.